Note: I was going to use the SBTB “I’m so excited” clip, but I watched it again and it just didn’t feel appropriate. No one has any earthly idea how good this Chippewa team is going to be under first year head coach Joe Bonamego, but they should be so exciting to watch. Now I know some of you may be thinking, come one Sam how can you talk up a team is exciting without knowing how good they’re going to be? Now let me answer that rhetorical question with another question. How can a team with a first year head coach wanting a hurry-up no huddle offense with an experienced, talented, gun slinging quarterback and questionable defense not be a fun watch? 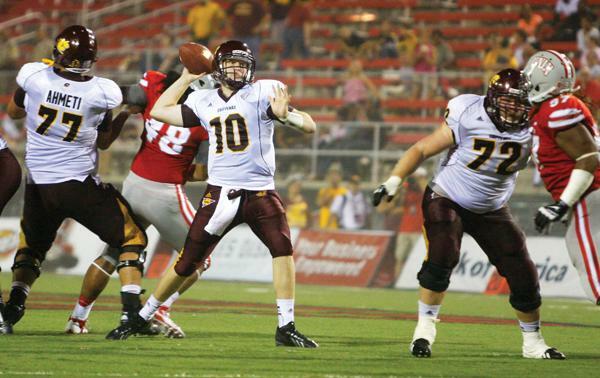 The aforementioned quarterback goes by Cooper Rush, and he’s a legitimate college star. Rush had a solid season in 2014, but his real coming out party was in the Bahamas Bowl. He threw for almost 500 yards and 7 TDs. His 7 touchdowns set an NCAA bowl game record for touchdown passes. The good news for Rush is that he should be able to throw behind a solid offensive lined anchored by center Nick Beamish who’s on several first and second team preseason All-MAC teams. The bad news is that his skill players are pretty inexperienced at this point. Titus Davis and Thomas Rawls were big time playmakers at wide receiver and running back respectively. Fortunately, there is a bevy of viable candidates to replace their departed production. Jesse Kroll and Anthony Rice are the most experienced returning receivers, and both put up solid numbers in complementary roles last season. Behind them, there are three sophomore receivers with breakout potential in 2015 in Mark Chapman, Corey Willis and Eric Cooper. Rawls’ 1,100 rushing yards may be more difficult to replace, and have fewer viable options. Saylor Lavalli, Martez Walker, and Devon Spalding have similar statures and 2014 stats. They are all around 5’9 and weigh around 200 pounds, with Spalding being a little taller and Lavalli slightly heavier. In the YPC department, they ranged from 3.5 yards per carry (Lavalli) to 5.1 yards per carry (Spalding). Lavalli and Spalding had 4 TDs apiece and Walker had one. That being said, it may not end up mattering who the feature back is, but the one point of concern for Spalding last year was fumbles. He coughed it up four times, whereas the other two didn’t fumble once. In the introduction labeled this defense as “questionable”, but that isn’t entirely true. The defensive line and secondary ought to be pretty good. The question mark lies in the linebacking corps, which is pretty much starting from scratch this year. For one, there is talk that they may revert back to a more traditional 4-3, as opposed to the 4-2-5 that Dan Enos ran, but I can’t really speak to that. The second thing is that they lost two of three linebackers who saw legitimate playing time last season. Tim Hamilton is back, and he played in all 13 games last season, but behind him there aren’t any proven commodities. Keep an eye on Redshirt Freshman Malik Fountain though; some people believe he’s going to be the real deal. Defensive line is likely the strength of the defense, and comparatively may be their best unit. That begins and ends with the defensive ends Joe Ostman and Blake Serpa. Ostman is the more heralded of the two, but both were productive last season with a combined 22.5 tackles for loss, 7 sacks, 4 forced fumbles, and an interception. Jabari Dean and Shafer Johnson, both of whom saw a fair amount of playing time last season, should anchor the interior line. 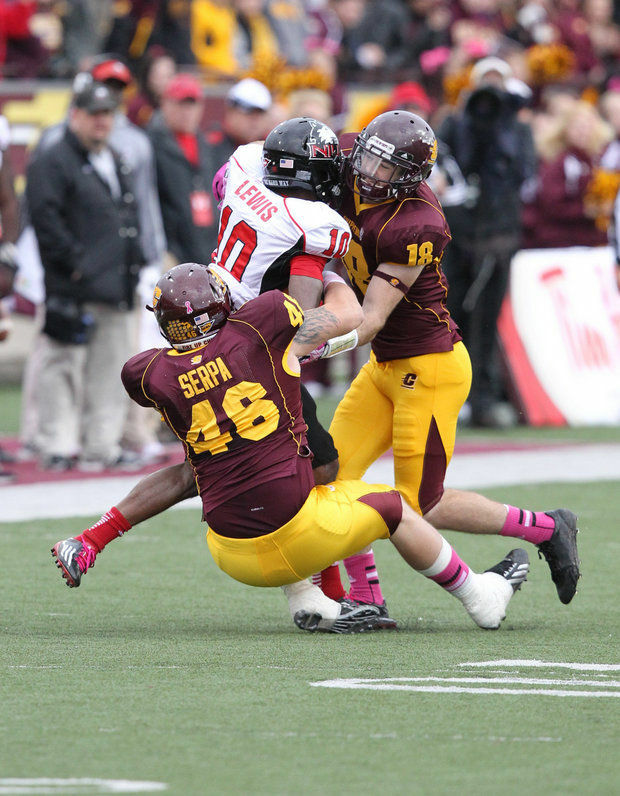 Tony Annese is an All-MAC safety, and will be the most important player roaming the back of the Chippewa defense. His 10 pass break-ups led the team last season, and with three interceptions he also tied for first on the team in that category. The man who tied him for interceptions, CB Brandon Greer, also returns, as does safety Kavon Frazier. With this trio, and whomever else Central Michigan plugs in at the other corner spot and/or nickelback spot the Chippewa secondary ought to be well equipped to slow down the pass heavy MAC offenses. Central Michigan has gone 7-6 in three straight seasons now, and if they were returning more proven help for Cooper Rush this would be the season to eclipse that. Unfortunately, I think it’s going to take some time for some new guys to grow into their roles and with Oklahoma State, Michigan State, Northern Illinois, and Western Michigan all showing up on the first half of the Chippewa schedule their isn’t much time for guys to grow this season. I believe the trend repeats this year, but this team should be set up to be a legitimate MAC contender in 2016. However, no matter what they do they’ll have trouble topping this at any point this season.